The West Virginia legislature successfully overturned the veto of Democratic Gov. Earl Ray Tomblin's veto on Saturday in a bipartisan effort to enact permitless gun carry in the state. Beginning June 5, anyone over age 21 who can legally possess a firearm will be allowed to carry it concealed on their person without having to obtain a permit. West Virginia has long allowed permitless open carry but, like most states, required a permit to carry a concealed firearm. With the new law the state will become the eighth in the nation to implement what gun rights activists call "constitutional carry." The law also creates a provisional permitting process for those between the ages of 18 and 20 who wish to carry a concealed firearm within the state. Individuals between the ages of 18 and 20 had previously been excluded from the permitting process altogether. 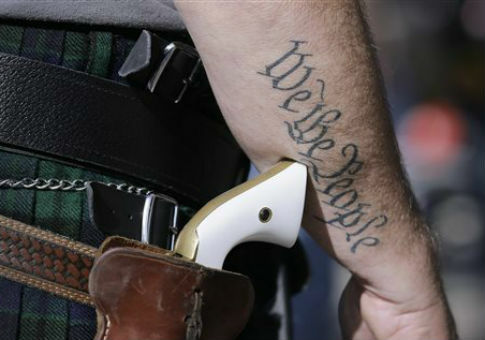 West Virginia's move to permitless carry marks the continuation of a national trend that began in 2003. Before then, only Vermont allowed law-abiding adults to carry concealed firearms without a permit. The pace accelerated over the last five years, with seven states adopting the policy. Concealed carry laws vary from state to state, but most adhere to one of three basic structures. The most popular, which is in effect in 34 states, is commonly referred to as a "shall-issue" structure, where applicants must be issued a permit if they pass a background check along with whatever training and identification requirements are set by the state. The most restrictive type of concealed carry law, adopted by only eight states, is the "may-issue" structure in which applicants can still be denied a permit even if they meet all of the requirements set out by the state. May-issue concealed carry laws often issue very few concealed carry permits to residents. The last type of gun carry law, adopted by only eight states, is the "Constitutional carry" permitless structure that West Virginia has now approved. The trend toward less restrictive gun carry laws has been cheered and promoted by gun rights activists at the national and state level. The West Virginia Citizens Defense League, which helped write their state's law, applauded the bipartisan vote to override the governor's veto. "We're extremely pleased that the legislature stood with West Virginia gun owners, showed their trust in lawful gun owners, and overrode the veto of Governor Tomblin," Art Thomm, the group's vice president and head lobbyist, told the Washington Free Beacon. "It's certainly a great day for West Virginia gun owners." The National Rifle Association echoed the West Virginia group's sentiment. "Self-defense is a fundamental right that must be respected," Chris Cox, head of the NRA's lobbying arm, said in a statement. "Law-abiding West Virginians are now free to choose the method of self-defense that best suits their needs. The NRA and our five million members are pleased that the legislature voted in support of West Virginians’ Second Amendment freedoms." This entry was posted in Issues and tagged Guns, New Gun Laws, West Virginia. Bookmark the permalink.